Raise the lower sash at least 2-3 inches. Release both tilt latches and pull top of sash toward you. To tilt-in top sash (not applicable for single hungs), first tilt-in lower sash. Then repeat steps 2 & 3 for top sash. Slide inner sash toward center. Lift sash up, remove and bring into house for cleaning. Repeat steps 2 & 3 for outside panel. Tilt-In Sliders are not made to vent as shown at right; tilt-in function is for cleaning only. Slide inner sash at least 2-3 inches toward center. Release both tilt latches, and pull center side of sash toward you. Repeat steps 2 & 3 for other sash. To open, unlock lever on side of window. Turn crank mechanism to desired position. To close, crank in opposite direction and engage locking lever to fully close and lock window. 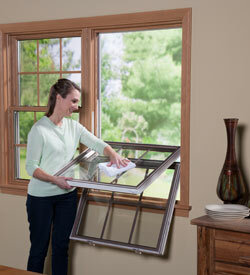 Any common household glass cleaner or mild detergent will clean your Sunrise window glass. Do NOT use any petroleum-based cleaner or solvent. We recommend using a soft cloth, but a paper towel is fine. Window and door frames also need regular cleaning to look their best. But don’t worry, we’ve done all we can to minimize the time spent to do so. Here are some tips for cleaning the PVC frames and sashes of your Sunrise Windows without damaging them. And while it is hard to damage one of our frames, it still can happen if you use harsh cleaners or super-abrasive sponges. Clean window and door frames with a mixture of mild dish soap* and water. Abrasive or caustic cleaners or solvents are never recommended because they might cause permanent damage to the frame finish. For instance, if you have a stain on your frame, don’t reach for the bleach. Always rinse completely with clear water and wipe dry. Check to make certain that drainage or “weep” holes are always clear of dirt and obstructions — both inside and outside the window or door in the bottom of the frame. *Ivory® is an example of a mild dish soap. Always test cleaners in an inconspicuous area first.